"Even before those toss-up states are allocated, every single forecast has Clinton over the 270 threshold and half already have her on 322 or more...If the current betting favourite wins in every state - she will end up on 352." With less than a fortnight until polling day, the verdict from various prediction models and Betfair markets is unanimous. Hillary Clinton is overwhelmingly likely to become the Next President. On our main market, the former First Lady is rated 82% likely at [1.22], compared to 18% for Donald Trump at [5.6]. Right now, layers at [1.23] are speculating that the odds might move away from Clinton, therefore creating a trading opportunity. I'm not convinced. 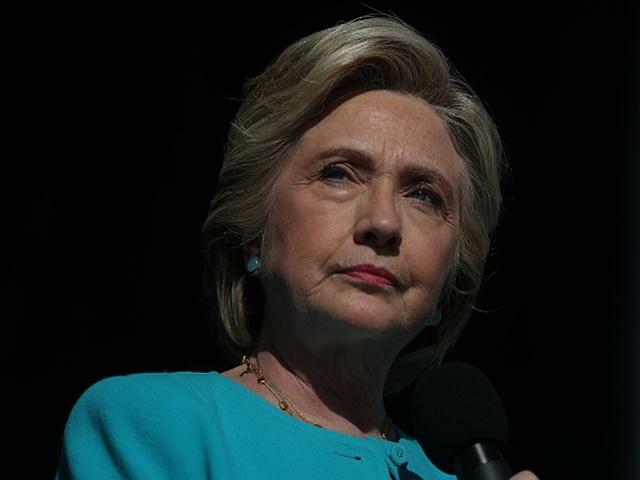 Unless the polls have been systemically wrong from the start, her lead is bombproof and, given the balance of the electoral college, a Trump victory feels almost unimaginable. While I certainly wouldn't deter big-hitters from piling into that [1.22], there are numerous less risky, great value options in our wide range of side markets. Particularly regarding the distribution of electoral college votes which, once again, understate Clinton's supremacy in comparison to other models. 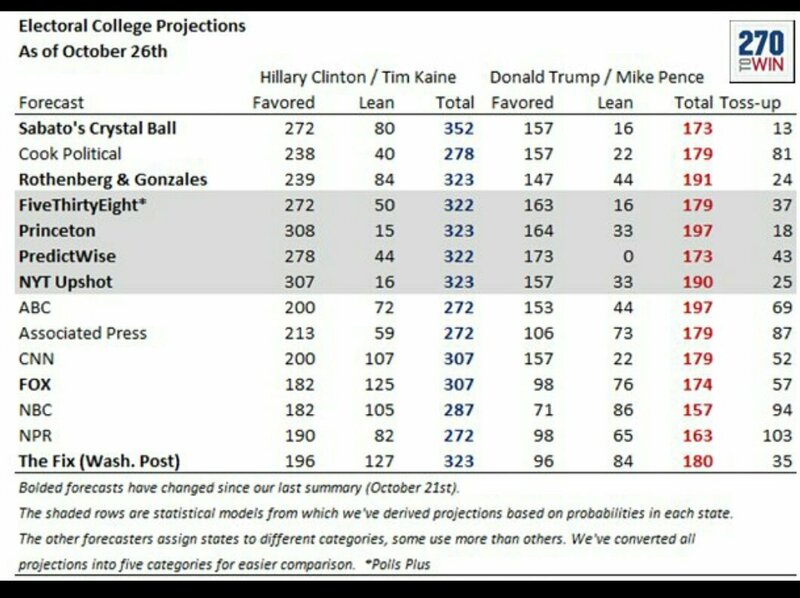 See below, for example, the current projections from a range of expert sources - all of which include a substantial number of toss-up states. Even before those toss-up states are allocated, every single forecast has Clinton over the 270 threshold and half already have her on 322 or more. All the projections below 322 include a greater number of toss-ups. Taking out the toss-ups, she is on course to go beyond 330. Barack Obama got 332 in 2012, and she is favourite to win every one of his states except Iowa. However she is favourite to win two states he lost - North Carolina and Arizona. If the current betting favourite wins every state - she will end up on 352 (perhaps minus one if Trump wins Maine Congressional District 2). There are two ways to bet on the electoral college - either via one of our Clinton Electoral College Votes markets, or different handicap lines ranging from Clinton -24.5 to -149.5. Regarding the handicaps, if we assume that Clinton and Trump will win every state between them, we can work out precisely what target is required. So backing Clinton -24.5 requires her to win by a 282/256 margin. Clinton -99.5 would equate to 319/219 - well below the par tally implied by those expert projections. Yet this morning, Clinton was being matched at [1.84] to pass what seems like a very reachable target. Plus, those handicap targets may be too generous to Trump, because they assume he'll win Utah. Yet as I wrote last week, he is under tremendous pressure from independent Conservative candidate Evan McMullin. If that normally safe Republican state rejects the party nominee, Clinton's handicap targets are reduced by six. That -99.5 line would require her getting just 313 votes, allowing her to lose Ohio and Iowa from Obama's states, so long as she wins either North Carolina or Arizona (she is favourite in both). There are countless permutations of state results and, if you're heavily exposed to Trump becoming president or just getting fairly close, individual state markets offer the perfect saver. No realistic Trump route to the Presidency, for example, discounts him winning all of Ohio, Florida and North Carolina. He's the outsider in each of that trio of key states and, even if winning all three, Trump would still need to pull off a massive upset elsewhere - probably Pennsylvania - and sweep all the other swing states. So if you're looking for a saver on Trump, why not spread a few bets around those four essential states? He is the outsider in each, ranging from [2.2] in Ohio to [6.0] in Pennsylvania. Theoretically, he could win all four yet still come up short of 270. Before making a projection or to better understand these electoral college numbers check out my detailed analysis of the 15 swing states.